The Neutron Economy: Support for nuclear: Broad but shallow? Coming just upon the heels of a recent post about public opinion on energy sources, I couldn't help but also notice this poll by Gallup which NEI points to, indicating a relatively constant support for nuclear following Fukushima. The takeaway? 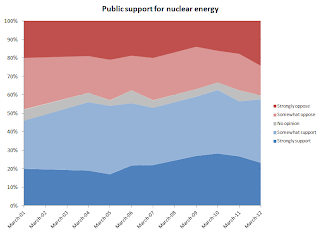 Despite a small uptick in opposition to nuclear following the events at Fukushima (from 38% to 40%), public support for nuclear is still high, sitting at 57% in favor or strongly in favor of nuclear energy. While Republicans (and Republican-leaners) more strongly favored nuclear energy (65% supporting vs. 34% opposed) compared to Democrats (and associated leaners - 50% support / 45% opposed), support across the Gallup poll appears to generally be broad across parties. The starkest reported differences in opinion were between men and women - 74% of men vs. 42% for women. Tellingly, a nearly parallel trend occurs for the perceived safety of nuclear (with 72% of men believing nuclear is safe compared to 43% of women). Given the somewhat less sunny projections from the recent Pew poll, how does one square the difference? Digging into the Gallup data, one observes that strong support and opposition have both historically ranged around 23% and 21%, respectively; the bulk of support and opposition has been in the more moderated "somewhat support" (33%) and "somewhat oppose" (19%). How has this changed in the events following Fukushima? Overall, not much - overall support remains constant at 57%, although one observes some erosion in self-identified "strong" support. Meanwhile, strong opposition has hardened (growing from 18% to 24% in the last polling period). One might square this against the Pew data in the sense that Pew specifically asked about the expansion of nuclear energy (particularly in comparison to other energy sources), while Gallup simply gauged overall public support. 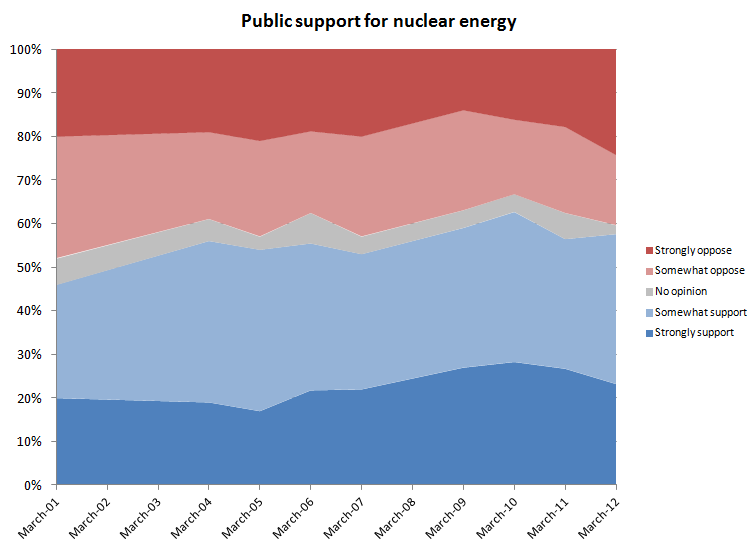 If one takes both trends as true, it paints a picture of public opinion over nuclear as stuck in neutral - a public which overall supports nuclear energy but is divided about its expansion in light of other perceived alternatives. Meanwhile, going back to the Gallup results, overall public perception of nuclear safety is relatively unchanged (57% responding that U.S. nuclear plants are safe, while 40% respond that they feel U.S. nuclear plants are unsafe). While the continued (accurate!) perception of the safety of the U.S. nuclear industry is encouraging, it speaks to the need for further outreach efforts, as well as perhaps the unique perception of nuclear compared to other sources (i.e., where constant, elevated risk - such as hazards presented by sources such as coal - is tolerated much more readily than low-frequency, highly dramatic events, even if the ultimate public health consequences are minuscule). Given the above, clearly nuclear is not in danger of a German-style phaseout. Yet the obvious challenge for public support of nuclear - beyond simply tolerating it, but in expanding it - is in making the case to the public that nuclear is both safe and essential - the latter of which comes down to arguments both over economics and the environment.